This raucous Australian hit is more amusing than it is good. The script, penned by co-star Barry Humphries with director Bruce Beresford, has plenty of amusing moments but sometimes leans a little too heavily on "shock value" bits of comedy that look dated and tame by modern standards. More importantly, both the script and Beresford's direction suffer from slack pacing that stands the laughs amidst dull stretches and makes the film's flaws and rough-hewn style that much more apparent. 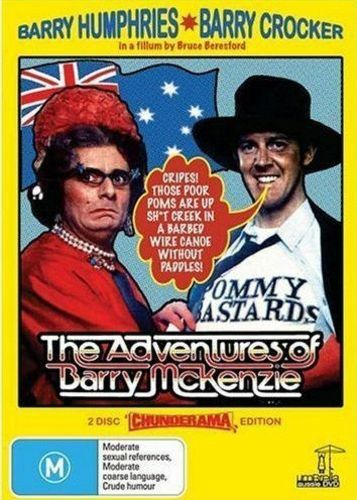 That said, those interested in Australian film might still find The Adventures Of Barry McKenzie worth seeing. Despite its issues with structure and pace, the script is full of colorful characters and dialogue that overflows with unique, Aussie-specific slang terms. It also boasts two fantastic comic creations in the form of the title character and Edna Everage. Those characters are brought into three dimensions by wonderful performances by Barry Crocker and Humphries: Crocker deploys a nice mix of downhome charm and deadpan comic timing to make the title character's naivete amusing and Humphries has a blast camping it up as Edna (the latter's work was so indelible that the character had a shelf life far beyond the Barry McKenzie films). In short, The Adventures Of Barry McKenzie is better as a time capsule than as a full-fledged comedy but is just amusing enough to entertain those interested in vintage Aussie film fare.